Cut your concrete to a finished grade, screed it flat, and vibrate it smooth in a single pass. 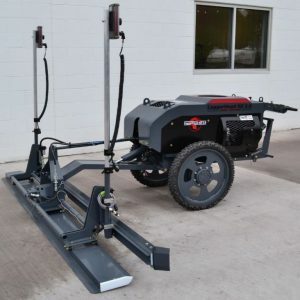 With the self-propelled CopperHead® XD™ 2.0 you get superior productivity, labor savings and improved levelness with this updated walk-behind Laser Screed® machine. As with all Somero® models, the Copperhead® sets the grade automatically, allowing your crew to move quickly and efficiently. Ideal for slab-on-grade and upper decks applications; but improves your performance over chaired rebar or mesh, in-floor heat and freezer slabs, including ice rinks. The machine is inspected by a Somero Certified Technician to meet our minimum standards. Includes a 1-Year Factory Certified Warranty, NEW engine, upgraded control panel, Quick Grade-Set™, on-the-fly grade adjustment and SSR receivers.